What makes Compost? Microorganisms that Make Rot Happen. The Little Guys who Make it Happen. Every compost pile is a complex eco-system of decomposition experts. "Team Compost" consists of microorganisms and macroorganisms choreographed to take advantage of changing temperatures, moisture, oxygen and pH. Each group has a specialty and as the conditions in a pile change, the main players change accordingly. While generally, I advocate letting mother nature worry about the particulars, understanding the different players can help you with pile management. For example, if you want to speed up a pile, you will increase the conditions that bacteria like, (adding green matter, increasing the heat, etc) and as a consequence, reduce the fungi. Reducing the fungi is OK, but bacteria are not good at digesting lignin (part of woody matter which fungi are good at digesting). This means that a fast compost pile will likely have woody bits left in it. So keeping in mind your team can help you decide what to do with you pile. Let's begin this 2 part series "What Makes Compost?" with the tiniest guys--the microorganisms. The main groups of microorganisms in soil are bacteria, fungi, protozoa and actinomycetes. These tiny little creatures are major players in decomposition. In a teaspoon of compost, you may find up to a billion bacteria, 440-900 feet of fungal hyphae, and 10,000 to 50,000 protozoa. In a similar but more dramatic statistic, one once of healthy soil may contain 54 miles of fungal strands. These tiny guys are what drive decomposition and get the whole thing going for the larger players to come. Bacteria are the most abundant microorganism in soil. 80-90% of all microorganisms in compost are bacteria. The first way to think of bacteria for composting are aerobic and anaerobic. Aerobic bacteria need oxygen. They are your composting friends. Anaerobic bacteria will decompose your organic matter without oxygen but they are the "bad neighbors" of decomposition. 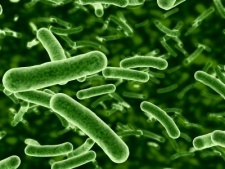 Anaerobic bacteria are slow--as much as 90% slower than aerobic. Your pile will slow down if you suffocate it. The second way to think of bacteria for composting is by their temperature preferences. The bacteria that love the coolest temperatures are the psychrophiles. Generally, they love the temperature at 55F (13C), but they range from 30-70F (0-40C). They might be the first bacteria on the scene in a pile, and will function, albeit slowly during the cold winter months, but if you are making your pile in the hot summer months, these guys are on break. They just don't like the heat. In the spring when the snow melts and you notice your pile starting to heat up, it is thanks to the psychrophilic bacteria who are getting to work while their heat-loving co-workers rest. In most cases, the first group of bacteria to arrive at the composting party are the mesophiles, who like the temperature around 70-90F (20-35C). Most of the composting in a pile is mesophilic and there are many reasons that you would like your pile to stay in this range. This temperature is comfortable for worms and insects to work in tandem to the bacteria. At this temperature, the mesophilic bacteria are beginning the process of breaking all the organic matter in to carbohydrates and proteins. Carbohydrates, in turn, break down further into simple sugars, organic acids and carbon dioxide, while the proteins become peptides, amino acids, ammonium compounds, atmospheric nitrogen and nitrate. As they do this, small amounts of heat are released. If the conditions are right this heat, a by-product of digesting carbon compounds, can raise the temperature of the pile higher than the comfortable range for the mesophiles and then the next group moves in. Heat is a by-product of decomposition but it is not what actually burns up the organic matter. Heat results from the metabolic processes of the microorganisms. Each group of organisms has a preferred temperature range, so if a pile heats up, or cools down, the population of organisms within the pile will shift and change. Similarly, the organisms in the outside of the pile, which might be cooler than the core (depending on the weather) will be different than those in the inside. By using this knowledge and deciding to mix the pile or not, you can steer your compost to your desired result. Thermophiles, which take over at around 100F (40C)and continue until the temperature stabilizes at 160F (70C) burn through the organic matter quickly. Typically, they work at these high temperatures for 3-5 days, and then, if the conditions in the compost pile are not changed, will complete their work. The temperature in the pile will drop and the mesophiles will continue their more moderate work. This phase will continue until all the organic matter is reduced to its smallest components. If you decide to turn the pile after the thermophilic stage, it will again heat up. This cycle can repeat 3-4 times until you have exhausted the energy supply for the thermophiles. Like managing any team, to get premium performance, you want to give the players their favored conditions. Managing a pile is all about keeping the temperature, water, pH, oxygen, energy source (carbon) and protein source (nitrogen) in a good balance. You want all your players happy, and keeping your bacteria happy is an excellent place to start. Another benefit of a healthy bacteria population in your pile is that they produce enzymes. While bacteria are alive, they produce enzymes to aid in their digestion of complex carbohydrates. Some of the materials most resistant to rot, cellulose and lignin are attacked by enzymes. After the bacteria die, these enzymes continue to work, decomposing long after the bacteria have left. They also help fungi and actinomycetes plod on, finishing up the hardest materials. Fungi are primitive plants that can be single-celled or multi-celled and filamentous. They lack chlorophyll so they can't make their own carbohydrates. They take over the compost pile in the final stages and prefer moderate temperatures 70-75F (21-24C), although a few forms can live as high as 120F (49C). Fungi can be associated with digesting the carbon materials in the pile and prefer a pH of 5.5-7.0, slightly more acid than their bacteria friends who like the pH slightly alkaline between 7.0 - 7.5. These organisms are part bacteria and part fungi. They like moderate temperatures. If your pile has grayish "cobwebby" fluff all over it, these are the actinomycetes. The actinomycetes give a pile a pleasing earthy smell, a result of special enzymes they excrete. Actinomycetes play a special role in creating humus. They work many feet below the surface of the soil (most bacteria stays in the top foot), creating humus under the roots of the plants. Actinomycetes and bacteria do not play nice together. Actinomycetes produce an antibiotic which will kill off the bacteria when they move in. Not to worry; they are a normal part of the decomposition process and should not be viewed as pests. Larger and more complex than bacteria, Protozoa play only a minor role in composting. They behave similarly to bacteria. Onward to Part 2 of "Your Compost Team--Worms, Bugs, and Shrews in your Pile."